For all Indian Music & Bollywood Music fans, you can listen free Bollywood songs on Android with Dhingana App. Before exploring the app, let me tell you about the Dhingana. Dhingana is the largest online collection of Indian Music which brings the best Bollywood and Indian Music on the web and mobile. Dhingana.com gives you instant access to music from every corner of India. You can listen variety of Indian songs such as Hindi, Tamil, Punjabi, Kashmiri and many other Indian language. 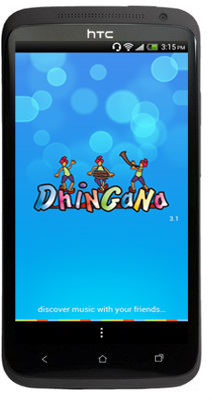 The best thing about the Dhingana is that it offer the app for almost all mobile platform. Dhingana uses Facebook open graph service, from that you can discover what your friends are listening to, and share your play lists, favorite songs and albums with your friends with one click. Dhingana for Android bring the awesomeness of Indian Music on your mobile. you an enjoy the free music for Free from different Indian language and Bollywood songs. When you start the app, it’ll take you to the ‘Top Songs’ where you can listen Top 20 songs. You can click on Shuffle or Play All button to listen top 20 songs. Swiping Left will bring the album of all New Releases Movie while swiping right will bring Top Playlist. Hitting the Play button will take you to the ‘Now Playing’ Activity. Now Playing Window has 5 tabs just below the main Tab with the following buttons: ‘Add’ button will add the current song to the playlist, next is ‘Like’ following with ‘Dislike’ button. You can click Like or Dislike if you love/hate the song. Below is the Players control with Play, Next, Previous, Shuffle and Play buttons to control the track. Swiping Left will give the Song info of the current playing Track such as Album, Singer, Music, Lyricist name etc. Swiping Right will bring the Player Queue where you view, Save, Edit or Clear the playlist. At any time you can go to Home Screen or Now Playing screen from the Menu button. While you can switch to any other Indian language from Actionbar. The Song quality is quite if listen on 3G or Wi-Fi. The quality may vary with you data connection. The App is user-friendly but sometime I feel that touch response is not good as I’ve to push the button twice to perform any activity. The Songs has stored temporally in your cache so once you already played the song it’ll start without any buffering. The app is battery hogger, first it need data connection + the ads between the app will eat your battery faster. Listen to unlimited songs for FREE from different languages or genres like Hindi, Oldies, Marathi, Tamil, Telugu, Malayalam, Sanskrit, Punjabi, Bhojpuri, Bhajans, Ghazals, Pop, Remixes, Relaxation, Meditation and many more. Search and discover new songs all the time. The awesome “Play All” & “Shuffle” features allow you to play any number of songs one after the other in Radio mode. Listen to “Top Songs” from all the different genres.